In previous posts, I’ve talked about a few ways you can get better control of your autofocus. But, there’s also a little switch on your lens that can help it focus faster. The switch (pictured above on my Canon 300mm f/4L lens) basically tells the lens where you’ll be focusing: either on a near object or a far object. It limits the range of where your autofocus will search. This little switch may not be available on all lenses (it really only makes sense on long telephotos), but check your lens and manual to be sure. I did a quick search for Nikon lenses and found out a similar switch is available on their longer lenses, it’s just called something different: focus limit switch (you can set it to “LIMIT” or “FULL” where the “LIMIT” setting will only try to focus on far objects). THANKS STEVE THIS WAS A BIG HELP FOR ME IN PHOGRAPHING LANDSCAPES. I find this is useful when using my Tamron 90mm 2.8 Macro Lens. It has the full/limit switch on my Canon mount. Wow, Steve, I had no idea this switch existed. I’m really hoping there’s one on my Sigma… one of my biggest frustrations is the lens deciding to focus on the twig in front of me rather than the bird further away…. thanks for the post! @Amy – if the switch isn’t available on your Sigma lens, then you can also try manually turning the focus ring to a farther distance and then autofocus again. This helps sometimes too, cause if your lens’ focus ring is set at a somewhat close distance (something like 5 ft), then it’s more likely to autofocus on something that close. Steve – I’ll try that since there was no switch! Thank you! I truly enjoy all your articles. Could you please tell me what to do when you take a pic and no matter what you do, the sky turns too white and cannot be changed even on photoshop? @Gemma – Thanks for your kind words! The “white sky” problem is very common, and usually happens because the sky is so bright and everything else in the image is dark (your camera can’t handle that kind of range of brightness). One solution is to use a polarizing filter to darken the sky, but this will only work when your camera is pointed in a direction that’s perpendicular to the sun. Other things you can try are taking two shots (one exposed for the sky and one for everything else) and then combine the shots later in photoshop, or you could try using a graduated neutral density filter. Thank you Steve for your response. 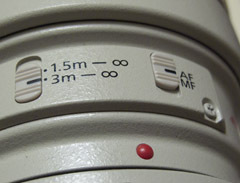 My Panasonic FZ50 has a focus switch on the lens barrel AF L, AF Macro and MF, my question is what does the L signify?